Using this powerful option, you can reverse engineer Gerber data from any original source and create an Easy-PC design. Load existing Gerber files intelligently into Easy-PC and rebuild them into our design format. The Gerber Importer allows you to build and reuse components, fully rebuild track paths with vias and layer changes and regain full component placement. The result is a layout that looks and feels like it was originally created in Easy-PC from scratch. From this you can even rebuild the PCB back into an original Schematic using the Reverse Engineer option in Easy-PC. All Gerber files used for plotting the design are imported at the same time. A single dialog allows you choose multiple files and select their usage before displaying the file names. You can add, edit and manage files in this dialog. 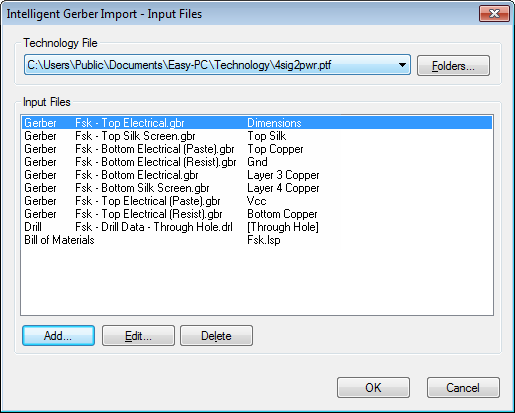 You can import Gerber files, NC Drill files and bill of materials (BOMs). During the process, 'flat' artwork pads are rebuilt into their pad stacks and given appropriate style names based on their size. Drawn shapes in the Gerber files are rebuilt into tracks and automatically assigned net names. Connectivity is reconstructed through pads acting as vias at this point and to terminating pads. The full track path is rebuilt. Component details are rebuilt in two ways depending on what is available to you. You can use existing components from your library and using a selection of areas within the design, can identify then replace components. Alternatively, you can select areas of the design (usually around identifiable components), then use the Generate Component option to recreate the component and footprint in the design. Using this facility enables the original placement position of the components to be fully retained. Pads within the design acting as vias on tracks can be turned into vias using the Pad to Via option. Multiple selection of pads enables this task to be completed quickly. If the original bill of materials (BOM) is available, this can also be used during import. You can apply the existing BOM to recreate the original parts list. Where components match those in the existing library, they are added to the component bin for the subsequent replacement of imported pads and shapes. Once the PCB design is fully rebuilt, using the Reverse Engineer option, you can then rebuild the Schematic design as well. So, from original Gerber files, you can completely rebuild your Project in Easy-PC format, this fully rebuilds your design and library IP in a reusable format.